One day in 1991, Father Todd Riebe was walking with some friends along a dusty street in Juba in southern Sudan. Their quiet stroll was brought to a sudden halt when artillery shells began exploding all around them. Juba had been a frequent target in a decades-long civil war in Sudan. “It was right there [where we were],” Father Riebe said. “In fact, the person right next to me was killed. At the time, Father Riebe, who grew up as a member of Sacred Heart of Jesus Parish in Terre Haute, was a member of the Comboni Missionaries religious order and was ministering in Juba as a high school principal. Two years later, the Sudanese government expelled him and the other members of his order in the country. He returned home to Terre Haute for a sabbatical and soon began assisting at St. Patrick Parish. In early 1995, he was asked to lead the parishes of Holy Family, St. Andrew and St. Mary in Richmond, and has ministered there ever since. 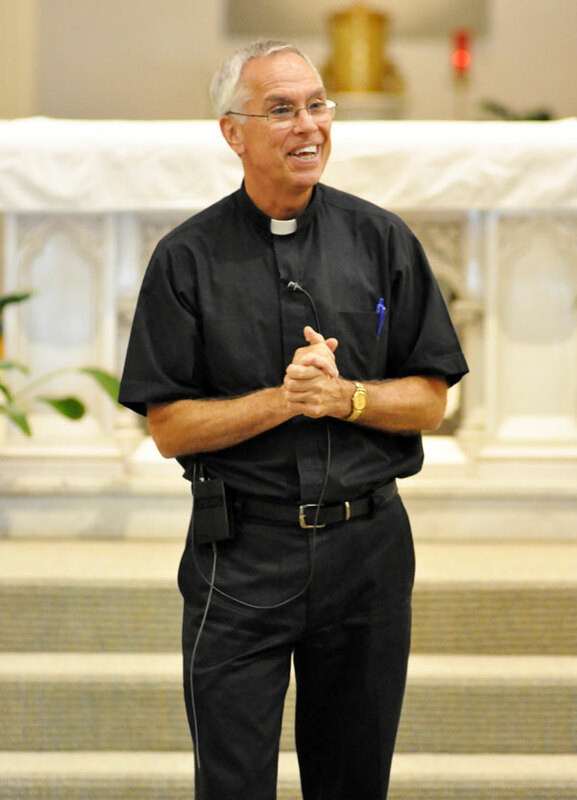 He became a priest of the archdiocese in 2000. Although a world away in many ways from his pastoral experience in Richmond, Father Riebe said the eight years that he spent in Sudan prepared him well for parish ministry in the archdiocese. While he saw extreme material poverty in war-torn Juba, he saw a spiritual richness in the people who lived there. On the other hand, after he came home to Terre Haute, Father Riebe gained a new appreciation of the spiritual poverty of so many Americans. When he arrived in Richmond, Father Riebe saw great spiritual riches in the three parishes there. But their members often kept their heritage to themselves, according to lifelong St. Andrew parishioner and current deacon candidate Frank Roberts. “In the past, each parish was jealously involved in protecting its identity and its independence from the other parishes,” said Roberts, 73. “But [Father Riebe] led and completed the joining of the three into the Richmond Catholic Community. The founding of Seton Catholic High School in Richmond, which opened in 2002, has been the largest among these projects, one that both needed the three parishes to come together and nurtured the bonds among them. One of the main tasks to make the high school a possibility was to renovate an old school building on the St. Andrew Parish campus. But with his help and that of many Catholics in Richmond, it succeeded. While Father Riebe is quick to spread the credit around to many other people for bringing the parishes together and in the founding of the high school, Roberts said his pastor’s holiness has had a real and lasting effect on the Richmond Catholic Community. Father Riebe’s dedication to his priestly life and ministry have also nurtured vocations in other people. Father Jeremy Gries, administrator of St. Mary Parish in Rushville, spent the summer of 2006 ministering in the Richmond Catholic Community as a seminarian. At the time, he was unsure if the priesthood and parish ministry were really where God was calling him in his life. Franciscan Sister Maria Kolbe Elstro recalls Father Riebe’s first day ministering in the Richmond Catholic Community. On that day in 1995, she was a fourth-grade student in a religious education program there. She and her class were doing jumping jacks because they had not memorized the beatitudes. Father Riebe stopped in the classroom to see what all the noise was about. She experienced this in a special way in 2009 shortly before she entered the Sisters of St. Francis of Perpetual Adoration in Mishawaka, Ind., as a postulant. Her sister had just given birth to a baby boy that was ill and had to be rushed to Riley Hospital for Children in Indianapolis. Such dedication to his vocation influenced her own calling. “The way he gives [of himself] has taught me that we need to fully give of ourselves as priests or as religious,” she said. And the way that her longtime pastor helped lead three parishes into one community of faith led her to understand the give and take of life in a religious community. Gratitude and awe are at the heart of Father Riebe’s thoughts about his life as a priest—whether it is in Richmond or far away in Sudan.